Students in Korea who were born in the year 2000 took the national collge entrance exam Thursday, and several pop stars were among them. On the morning of the test day, reporters spotted several teenage stars headed to their assigned test sites. IZ*ONE’s Kim Chae-won went to a high school in Songpa-gu, Seoul, flanked by her bandmates Kang Hye-won and Sakura Miyawaki who walked her to the gates in support. 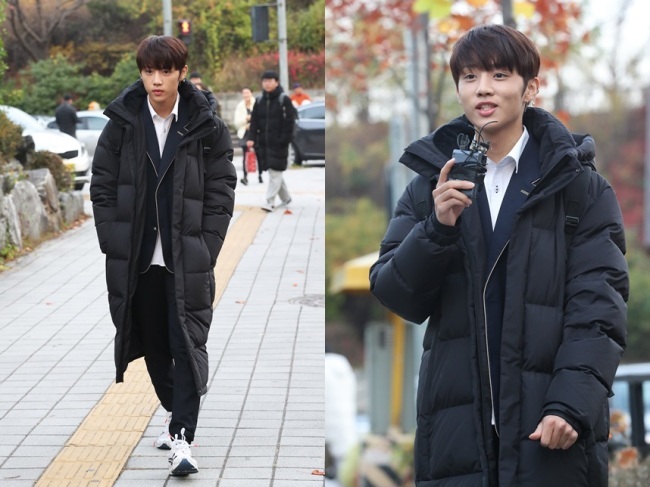 Golden Child’s Choi Bo-min, who attends the same school as IZ*ONE’s Chae-won, headed to Jamsil High School in Songpa-gu, carrying a box of bread. He said his bandmates prepared him a doshirak, or a lunchbox, to keep him nourished during the long test. The Boyz’ Sunwoo also went to Jamsil High School. TRCNG’s Hyunwoo and Jisung, who go to the same school as IZ*ONE’s Chae-won and Golden Child’s Bo-min, were also assigned Jamsil High School for their test. 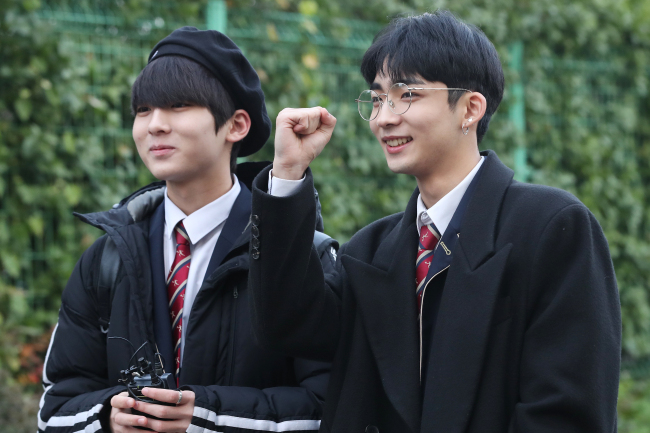 Hyunwoo wore large round spectacles and Jisung wore a black beret.